A handcar is a maintenance of way car powered by its passengers or people pushing the car from behind. These cars typically feature an arm that pivots like a seesaw on a base. Passengers alternately push down and pull up to move the car. 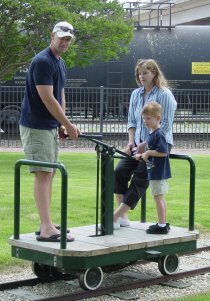 The first Saturday of every month is Family Day at the Temple Railroad and Heritage Museum. 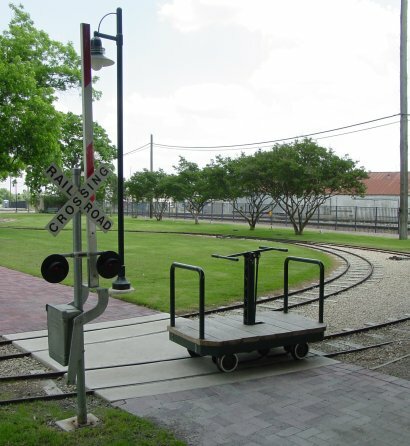 Handcars used to be used by railroad service personnel for railroad inspection and maintenance. In the past, these personnel were called Gandy Dancers (a slang term for workers who maintained railroads in North America). Due to the handcar’s relatively low weight, they can be placed on and off the rails at just about any location. Handcars have since been replaced by self-propelled vehicles that do not require the use of manual power, instead relying on diesel or electricity to move the vehicle. If you watch carefully, you can sometimes see a procession of these bright yellow vehicles pass in front of the Moody Depot.